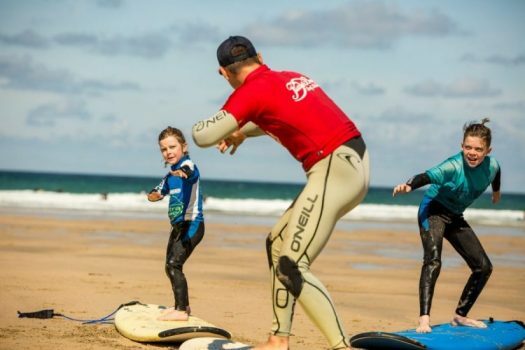 The Fistral Beach Groms Club is for kids aged 8+ years who are looking to either start surfing, or improve. Meeting once a week between April – September the sessions are 2 hours, all the equipment is provided. Fistral Beach Groms Club focus’ on small groups, and providing professional coaching to help improve the water confidence and surfing ability of local kids. Fistral Beach Groms Club has been running for four years. The focus is on small groups of children receiving coaching from experienced and professional surf coaches. Fistral Beach Groms Club ensures each child receives an extremely high level of supervision and instruction in the water. The beach and water sessions are a total of 2 hours. Covering a variety of topics from beach safety and sea awareness skills, alongside water skills. Fistral Beach Groms Club is running from the start of April, until the end of September. Meeting at Fistral Beach Surf School for 10.30am, the groms will then have time to get changed and catch plenty of waves to be back at the school for 12.45pm. Below are a list of the dates, all run from 10.45am-12.45pm. To ensure we keep coach to student ratio’s as low as possible pre-booking is essential. Once payment has been received confirmation of membership will be sent. If your child loves the water, is a confident swimmer and would like to join our Groms Club contact us at FISTRAL BEACH SURF SCHOOL or phone us on 01637 850737.